There are hundreds of blueberry muffin recipes but this one is my all time favorite. 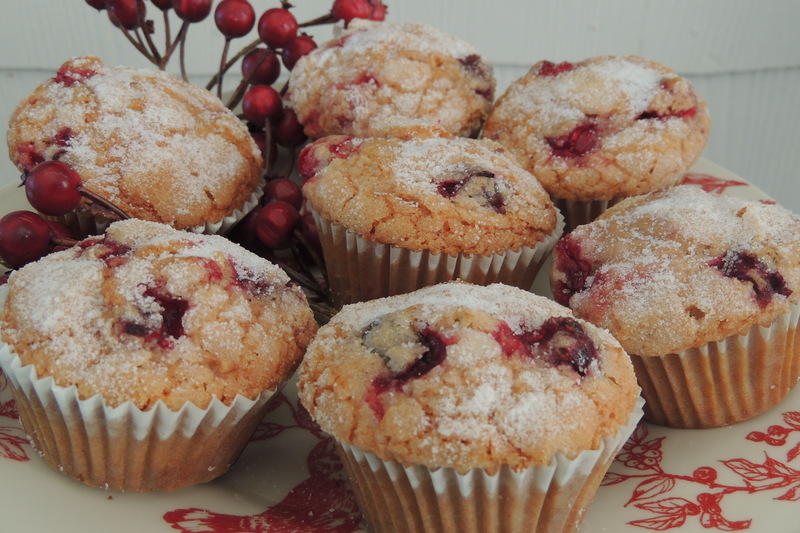 A hint of lemon, the surprise of fresh cranberries, and the character of buttermilk make these muffins special. The recipe makes 8 muffins but they won’t last long, so it might be a good idea to go ahead and double or triple! Happy Memorial Day and Thanks to All Who Served! Preheat oven to 375, and line a standard muffin tin with 8 paper liners. Beat egg, oil, & buttermilk until smooth. Add sugar, vanilla, & lemon. Add baking powder, salt & flour, mixing until just combined. Fold in blueberries. Using a 1/4 scoop, fill each muffin cup almost to the top. Add 3 cranberries to each muffin, pushing down to cover with batter. Sprinkle about 1/2 tsp sugar on top of each. Bake 18 – 20 min until muffins are lightly browned. Makes 8 muffins. Enjoy with a cup of tea on a beautiful Memorial Day in your own backyard!